Samsung Unveils Gear 2 and Gear 2 Neo Smart watches. The battle has long been raging about the newest generation of smart watches and how they’re poised to take on the world. Well, Samsung has ditched its Android and now unveils two Tizen-powered smart watches that will be available for sale in April. 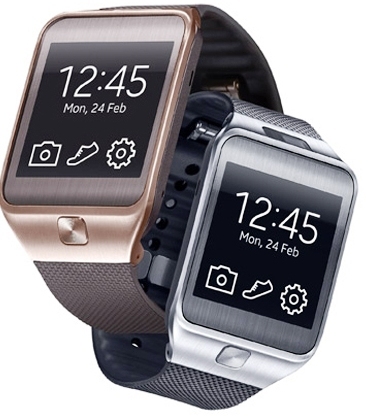 The wearable watches = powered by Samsung’s Tizen platform – are named Gear 2 and Gear 2 Neo. The lightweight timepiece features a camera equipped to the main body of the Gear 2. The Gear 2 Neo has no camera. The watches are compatible with more than 24 different Samsung Galaxy smart phones. They enable the wearer to accept or ignore incoming calls and messages, and provide instant notification options. The watches make their debut just six months after the unveiling of the Galaxy Gear watch that many said was bulky and hard to use. The new Gear 2 watches are slimmer and are offered wit h sophisticated color strap options offered with the Smart phones include charcoal, Gold Brown, Wild Orange for Gear 2. Gear 2 Neo will only be offered in charcoal, Mocha Grey and Wild orange. Additionally, the home screen background, clock face and font are customizable. A few new options include remote TV controlling, heart-rate monitor and music play function. While it may attract some, I’ll stick with today’s top mechanical masterpieces.